The Swern oxidation is an organic reaction used to convert a primary alcohol to an aldehyde and a secon-dary alcohol to a ketone using DMSO, oxalyl chloride, and triethylamine. 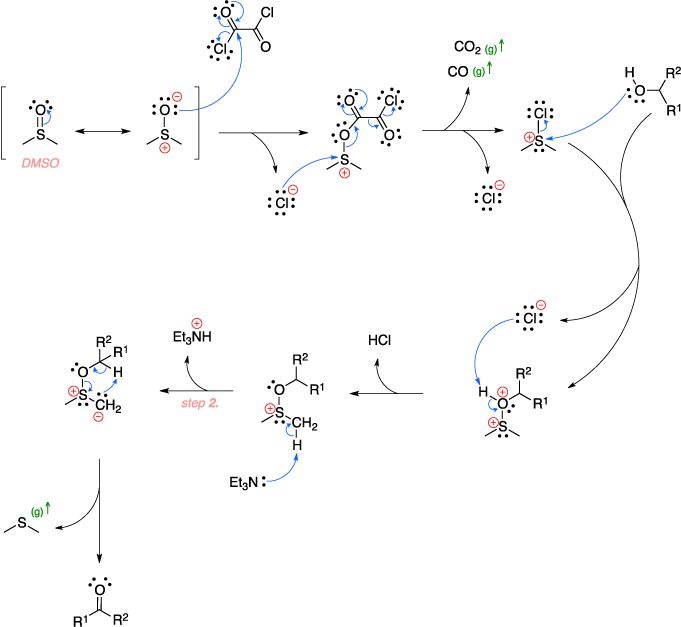 The mechanism begins with the activation of DSMO with oxalyl chloride which is then attacked by a chloride anion to form a chlorosulfo-nium cation and release both CO and CO2 gas. 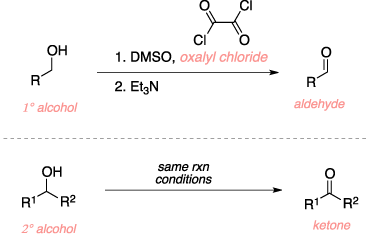 The alcohol then attacks the chlorosulfonium salt which releases the chloride anion and forms an alkoxysulfonium cation. Triethylamine then deprotonates the alkoxysulfonium at the alpha position to form a alkoxysulfonium ylide. A rearrangemnt then ensues which releases a molecule of dimethyl sulfide gas and results in the final aldehyde or ketone product. Omura, K.; Sharma, A. K.; Swern, D. J. Org. Chem. 1976, 41, 957–962. Huang, S. L.; Omura, K.; Swern, D. Synthesis 1978 297–299.